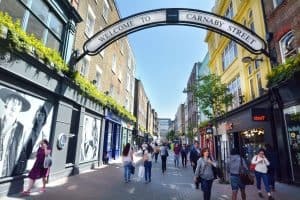 If you’re relocating to London and starting to research how to find a London apartment, my previous post addressed the current state of affairs with property (see “Renting London Apartments: The Current DL on LDN (Part 1)“). Given the high demand for (and low supply of) London apartments these days, a couple other trends have become prevalent in the London rental market. One unfortunate trend in the apartment rental market that I didn’t address last time is the “gazumping” phenomenon. If you’re not familiar with the term, its concept is a really, really lousy thing that landlords do to take advantage of the supply-demand situation I outlined in my other post. Let’s say you’ve searched and searched and have finally found your ideal apartment; the landlord has verbally accepted the offer that the lettings agent has put forth on your behalf. Already, those long-held dreams of moving to London are reaching fruition, and you’re fantasizing about what your life will be like with this lovely property as your base…this glorious flat that has everything you want, in the perfect location, for a rent price you can swing, and in which you can already visualize how well all your stuff will fit. Tra-la-la, life is grand. Contact our Relocation Agents today! Have questions about our process? Curious about cost? Give us a shout! Thanks! We'll contact you as quickly as possible. Traditionally a practice applied to property sales, sealed bidding is becoming more common for renting the property as well. Generally, a sealed bid involves interested buyers/renters putting forth an offer by a certain deadline (literally in a sealed envelope), and then all bids are opened and reviewed at a designated time to evaluate the winner of the property auction—i.e., whoever is deemed to have offered the best price in conjunction with wherewithal to proceed with the transaction quickly and smoothly (a.k.a. “proceedability”). Join me in my next and last post of this miniseries to learn how you can up your proceedability and overcome all these obstacles in your quest for the ideal apartment for your move.